James VII. of Scotland. 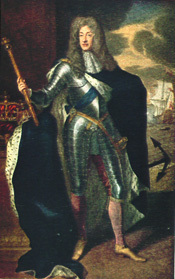 Second son of Charles I. Born 1633. Married, firstly, Anne Hyde, daughter of the Lord Chancellor Clarendon; and, secondly, after her death, Mary, Princess of Modena, to whom a son was born, June 10th, 1688, some five months before the coming of William of Orange. Crowned at Westminster the year of his accession. Monmouth's (natural son of Charles I. by Lucy Walters) rebellion took place the same year. He was defeated at Sedgemoor, near Bridgewater, and beheaded on Tower Hill (1685). The "Bloody Circuit" of Chief Justice Jeffreys through Somerset and Dorset, which brought infamy to his name, followed; the which series of judicial murders had not a little to do with the deposition of King James II. ; that infamous vengeance - "this marble is not harder than the King's heart," said one of his generals - and the committal to the Tower of the "Seven Bishops." James II fled from St. James's Palace on the night of December 12th, 1688, was seized soon after at Feversham, and brought back. He finally left England, December 23rd of the same year. After an abortive attempt to regain his kingdom by landing in Ireland (Kinsale), 1689, he returned to France, 1690, and died at St. Germains in 1701. "To preserve the government, both in Church and State, as it is now by law established," was the promise made by James II. at the date of his Accession. Before the three years of his brief reign had expired, he had succeeded in breaking it in almost every particular. It would not be easy to say which king's promises were the least to be relied on, Charles I. 's or James II.'s. Certain is it that the memory of the first is generally regarded with more consideration than that of the second. Although the Civil War undoubtedly caused more bloodshed in the kingdom, the second Stuart tyranny" provoked more hatred among the common people. It may be doubted whether the "Bloody Circuit" and its judge have their counterpart for ruthless injustice and cruelty in the pages of English history. "Do you not know that I am above the law? " said James to one of his court on a notable occasion. "You may be, your Majesty, but I am not," was the reply. A king who could speak thus, in the concluding years of the seventeenth century, having regard to his father's fate, was obviously not likely to reign over long "above the law" of the land, which law he had promised to maintain. Three years proved sufficient. Had King James II. reigned longer, a second civil war would probably have been the result. When he slipped away first from St. James's Palace, most people were glad to be rid of him, and sorry when he was brought back. The second occasion, he got away for good, and ended his days in exile plotting his restoration.